Protesters gather at Fountain Square in downtown Evanston on Sunday afternoon. Local religious groups hosted the peaceful demonstration to demonstrate solidarity and call for racial justice in response to the lack of indictments in the Eric Garner and Michael Brown cases. 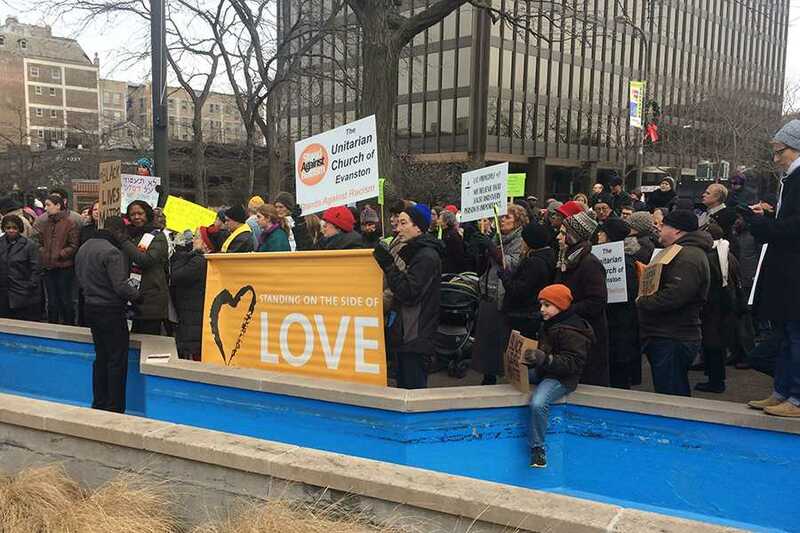 Members of the community and various religious groups flooded Fountain Square in Evanston on Sunday afternoon in a peaceful demonstration to call for racial justice. Religious leaders organized the event to bring people of various faith groups together in response to the recent grand jury decisions in Staten Island, New York, and Ferguson, Missouri. The crowd included these groups, along with residents of Evanston and the surrounding area, which were diverse in age, race and gender. About 20 minutes into the demonstration, people began to march along the sidewalks surrounding the square on Church Street and Sherman Avenue. A handful of Evanston police officers monitored the area and halted car traffic to allow protesters to cross streets. The event follows the decision of a grand jury Wednesday in Staten Island, New York, not to indict the New York City police officer for the death of Eric Garner, who died after being placed in a chokehold. The announcement Wednesday spurred a flurry of nationwide protests, which had already picked up Nov. 24 after a grand jury in Ferguson, Missouri, decided not to indict police officer Darren Wilson for fatally shooting black teenager Michael Brown. The demonstration was organized by the Evanston Pastors’ Fellowship and the Interfaith Action of Evanston, the same two groups who organized a community prayer the day after the Ferguson decision was announced. The religious groups decided to hold the event in order to bring the community together in solidarity behind the issue of racial justice, the Rev. Bret Lortie of the Unitarian Church of Evanston told The Daily. Some city officials were present, including Mayor Elizabeth Tisdahl, Ald. Delores Holmes (5th) and Ald. Jane Grover (7th). Holmes said there was no comparison between the events in Ferguson and Evanston. “We have a relationship here (with the police) — that’s the difference,” she said. As more people filled the the area for the demonstration, Lortie and the Rev. Dr. Karen Mosby of the Second Baptist Church spoke to the crowd about the reasoning behind the gathering. Lortie said that he was impressed with both the amount of people who showed up to the event, as well as the response of the police in handling the demonstrations. The peaceful nature of the protest in Evanston was different from many that have taken place in Ferguson, said St. Louis resident Danielle McCoy, who is originally from Chicago. While in St. Louis during the shooting of Michael Brown and the grand jury decision, McCoy said she directly experienced the protests that occurred in Ferguson. She said she tried to avoid the more violent demonstrations, in which many participants embodied a mentality of protesting the police and the officers’ presence. However, in Evanston, the gathering was held with the aim to raise awareness and show the city’s stance in support of the community in St. Louis, she said. Evanston resident Shari Iverson also stressed the significance of the protest’s message as one of solidarity, in which many different faiths are coming together to promote peace and justice. Iverson attended the demonstration with a group from the Reba Place Church, a Mennonite church, of which she is a member of the congregation. She helped display a banner that said “I Can’t Breathe,” a reference to Garner’s last words.